A city with plenty of charisma and personality; traditional and avantgarde at the same time. From the narrow streets of the Casco Viejo [Old Town] to the Gran Vía and the New Bilbao, there is a whole world of history and legends that have turned the small port on the banks of the river into a world benchmark. A friendly space for those who are interested in innovation, architecture, art, technology, design, leisure, gastronomy and culture. The Guggenheim Museum Bilbao (one of the most exciting buildings in the world) kicked off the ground-swell of creativity which Bilbao has successfully used to create an innovative and contemporary architectural jigsaw, both in terms of the shapes and the use of materials. These universal works offer an overview of world architecture in the first decades of the 21st century. And last but not least, Bilbao is an international point of reference in terms of cuisine. The excellent restaurants, found throughout the city, transform good meals into an art form. You can enjoy restaurants like Azurmendi, Mina and Nerua, Etxanobe and Zortziko, distinctive for their Michelin Stars. A symbol of creative gastronomy and haute cuisine. Other areas of interest in the city are “San Mames” and the “Old Town”. One of the greatest icons of Bilbao is its football club: the Athletic. “San Mamés Barria”, the new stadium, is the heart of a district which is currently undergoing social, commercial and residential urban transformation. Nevertheless, it is the Old Town that gives us a closer look at the city’s origins. This is an interesting route for discovering medieval Bilbao. Its cobbled streets, cantones, charming squares and corners bear witness to the intense commercial and port life that made the city grow. The character of the local people is cheerful and open, which shows in the atmosphere. 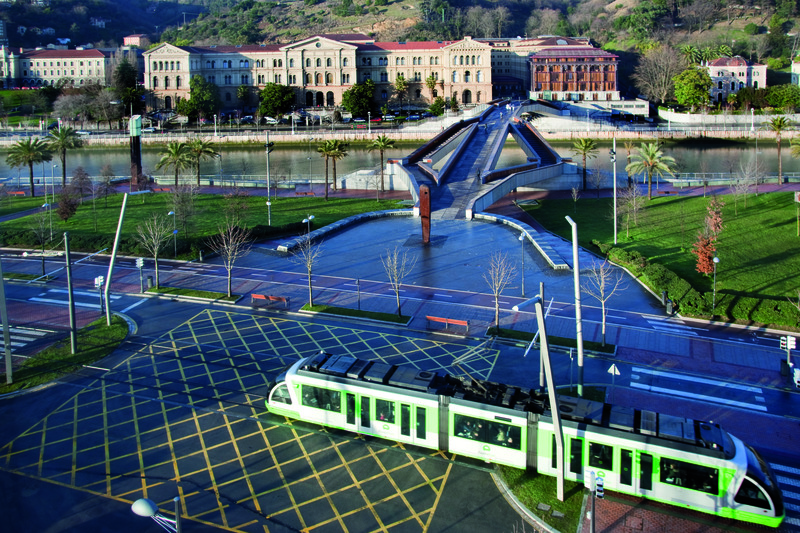 Thanks to the modern Metro Bilbao underground, beaches and other urban areas are easily accessible by public transport from the city itself. The University of Deusto was inaugurated in 1886. The concerns and cultural interest of the Basque Country in having their own university, as well as the interest of the Jesuits in establishing higher studies in some part of the Spanish State coincided in its conception. Nowadays, Bilbao is the centre of a metropolitan area with more than one million inhabitants, a city traditionally open to Europe. The central headquarters of the University of Deusto is located on the opposite side of the estuary, facing the Bilbao Guggenheim Museum, an emblematic symbol of the significant transformation of Bilbao during the last three decades. Thirty years after its foundation, in 1916, the “Universidad Comercial de Deusto” received a group of students who would be the first graduates in Economic Sciences in Spain. The University of Deusto is located on two separate campuses, in Bilbao and San Sebastian, with an office in Madrid. 11, 815 students attend the University of Deusto. Its staff of 1,268 is formed by 621 professionals engaged in teaching and research, 142 researchers and 505 administrative and services personnel. A large number of guest and visiting lecturers and experts work with the University. It is divided into six faculties (Economics and Business Administration, Social and Human Sciences, Law, Engineering, Psychology and Education and Theology). These reflect the main areas of knowledge, with 45 Bachelor’s and double Bachelor’s degree programmes, 47 Master’s programmes leading to an official Spanish diploma, 35 Deusto degrees and 8 PhD programmes offered. Deusto also has a broad range of innovative continuing education and executive education In-Company programmes. 10 research centres, 12 university chairs and 19 high-performance research teams are currently conducting 282 projects, 31 of which are European in scope and collaborate with prestigious universities across Europe and the world. Many of these projects are interdisciplinary and focus on social impact (human rights, competitiveness, applied ethics, gender, health, the elderly…). Evidence of the University of Deusto’s clear international orientation is seen in the 385 cooperation agreements it has signed with universities across the world. 1,660 international students from 97 different countries are currently enrolled at Deusto. The University is also developing the first stage of its Master Plan for International Degree Programmes. As a Jesuit University, Deusto is a member of the international network formed by over two hundred Jesuit higher education centres. La Comercial Building was completed in 1921, and houses the prestigious Faculty of Economics and Business Administration. In 1996, the modern ESIDE building (that hosts the Faculty of Engineering Studies) was attached to the back. La Literaria Building is the oldest among the buildings that make up the University. In this space are located the Deusto Law School, the Faculty of Psychology and Education Sciences and the Faculty of Theology. In 2002, the La Literaria Building was declared Historical Monument in 2002. The CRAI Library was inaugurated in 2009. The building is a big glass cube, designed by renowned architect Rafael Moneo and made up of ten floors with individual study rooms and group work areas, multimedia room, multipurpose rooms and a coffee bar. It is integrated into the campus thanks to the Father Arrupe Footbridge over the estuary. The Centenary Building, attached to the eastern side of the Literary Building, was built in 1989 based on a project by the architect César Sans Gironella. It is made up of two parts known as “New Building” and “Glass Building”. It hosts the Faculty of Social and Human Sciences.